This blog was conceived as a forum to put out my writing and my photography. For years I had another blog where I did that, as well as just about everything else. I wanted to separate my creative endeavors from the other stuff. I usually think of my creative outlets as writing and photography. While they are the bulk of it, I also cook and bake. Mostly I cook, and while I like it, it’s nothing spectacular. But at least once a year, I bake. Today is that day. My grandmother made sugar cookies for Christmas. And then my mom made them. And these cookies, in many respects, are Christmas for me. (They’re soft, unlike a lot of the sugar cookies I have this time of year that seem to be hard.) 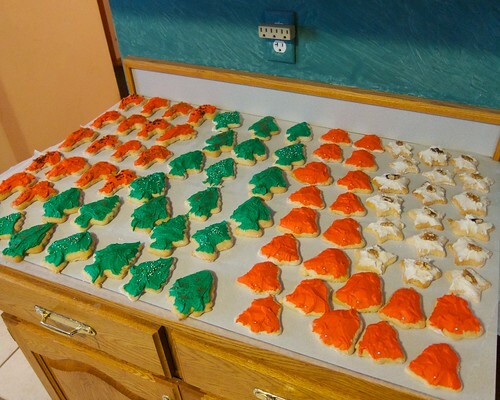 The first year I didn’t make it back to my family for the holidays, I made these cookies so I could still have some. And every year since, I carry on that tradition, even when I do make it back to my family for a visit. They are time intensive. I have to mix up the dough the night before (so it can refrigerate and stiffen up a bit). Then it takes four hours or so to cut, bake, and frost. And the frosting is homemade, too. Shortly after that first cookie baking year, I added another cookie to my tradition. They have quickly become famous amongst my friends. I suspect that’s because it’s rather uncommon in these parts. 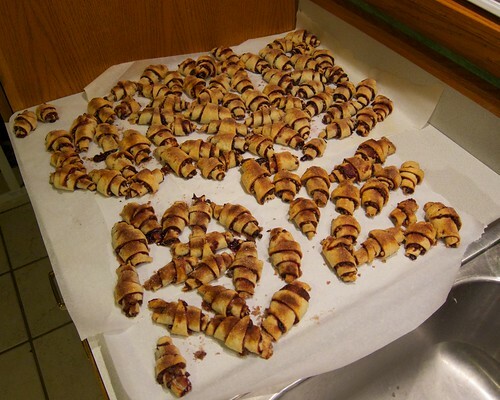 Rugelach is an eastern European pastry. I make mine with black raspberry jam and chocolate chips (rather than raisins). I have also made them with apricot jam. I keep thinking I should try cherry jam some time. Anyway, this is my creative blog. And this baking is another creative outlet for me. I can’t share a taste through the screen, but I figured I could at least share a couple of photos. Whatever your traditions are this time of the year, I hope they bring as much joy as this baking brings me.